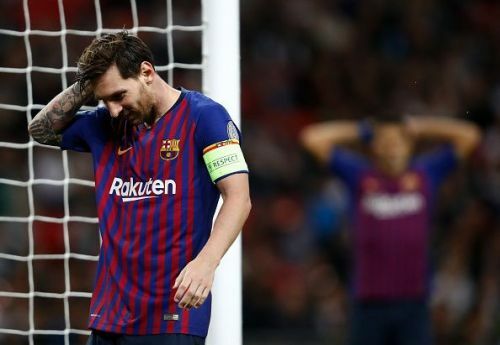 Lionel Messi left the Wembley pitch after Barcelona's 4-2 win over Tottenham Hotspur knowing that his team needs a lot of improvement. The five-time Ballon d'Or winner was the man of the match after scoring a brace and having a massive impact in the entire game. While speaking to Movistar+, Messi insisted that his team needs to stop giving opportunities to the opponents for capitalizing. As the case was with the 2 goals scored by Kane and Lamela in the second half. "We had a bit of bad luck while handling the game. Being ahead 2-0, we had two straight shots that hit the posts. Then, they scored in a counter-attack and were on the verge of leveling the game right when they scored after a rebound," said Messi. "Either way, we had a very good game. It's not easy to play a UEFA Champions League game away from home, especially against a team like Tottenham. We have to be happy because things went our way this time," Messi added. "The UEFA Champions League puts a cherry on top of every season, but in order to win it, you have to keep your chances of winning La Liga alive until the end. We are not leaving any of the competitions to focus on this one. Winning the UCL is special, but we will keep fighting to win the league and the Copa del Rey," he concluded. However, truth be told, it was a spectacular display of possession football displayed by the Spanish giants, as Barcelona now look forward to facing Inter Milan on the 25th of this month, and surely, the Argentine will work with his manager in order to fix the errors.